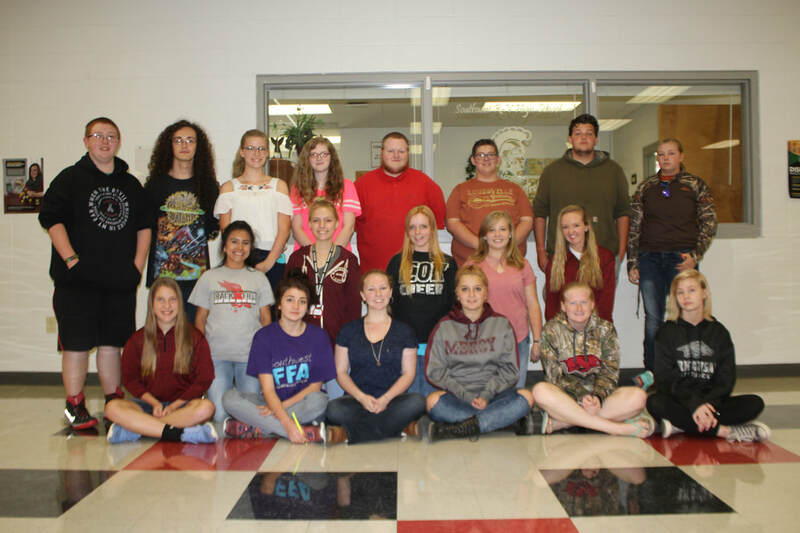 The Southwest R-5 High School Band elected officers on August 15. The new officers for the 2017-18 school year are pictured above. From left to right, in the back row: Michael Foster, Deven Maleki, Anna Trimble, Kara Jordan, Evan Still, Nathan Wallace, Aaron Beeson and Destiney Dulin. Middle row: Laisha Sanchez, Breanna Hamilton, Brooklyn Hamilton, Sarah Atkinson and Mariah Long. Front row: Lacey Reeves, Faith Ann Townsend, Grace Roller, Amy Guilkey, Shelby Pike and Katie Long. Not pictured: Mariah Munday and Summer Rusher. Officer positions are: president - Deven Maleki; president elect - Aaron Beeson and Katie Long; 1st vice president - Evan Still; 2nd vice president - Sarah Atkinson; treasurer - Mariah Long and Destiney Dulin; secretary - Lacey Reeves and Shelby Pike; student directors - Nathan Wallace, Brooklyn Hamilton and Breanna Hamilton; reporters - Michael Foster and Kara Jordan; colorguard captain - Sarah Atkinson; colorguard co-captains - Summer Rusher and Laisha Sanchez; band event planners - Mariah Munday, Amy Guilkey and Anna Trimble; and drum majorettes - Grace Roller and Faith Ann Townsend.